Green space is in short supply in Denver's Westwood neighborhood. In fact, Curatro Vientos—or Four Winds—is the first new park in the area in more than 30 years. 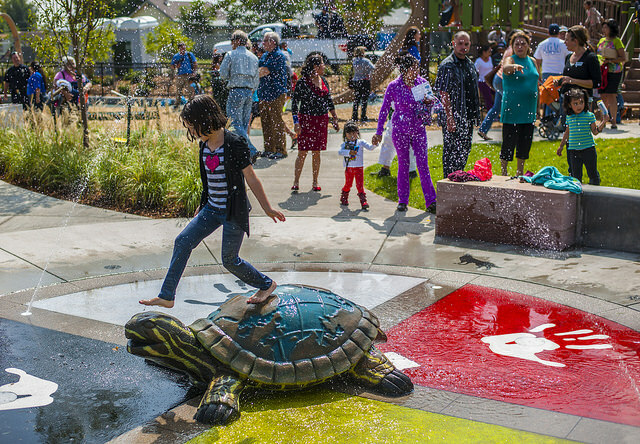 The park, which opened in October 2014, provides a vibrant community open space complete with playground, water play feature, two turf fields, a walking loop, and landscaping with native plants. To make the community’s park dream a reality, The Trust for Public Land helped purchase an abandoned property that once housed a run-down trailer park and auto body shop. This collaboration with Denver Parks and Recreation is part of an ongoing partnership to create and improve parks in underserved, low-income neighborhoods throughout the city.